oe: Amazing sound for east europe band. Recommended. Between 1966 and 1968 the Matadors belonged to the best beat groups in Czechoslovakia. At that time their enormous popularity might have been threatened only by the equally experienced "veterans” Olympic. (By comparing the former with the latter, think e.g. the never ending "Stones vs. Beatles” dispute…) So it was no coincidence that the Matadors were the second rock band after Olympic to have a full long player recorded and released by Supraphon in 1968. And it’s no coincidence either that their only album still belongs to the most sought-after items from former Czechoslovakia among vinyl collectors worldwide, being an undisputed classic of the so called freak-beat or psych-beat genre. The band was mainly influenced by british R&B acts like Them, Pretty Things, Yardbirds, John Mayall’s Heartbreakers Bluesbreakers or even the Kinks and the Who. But like many other Czech groups around 1967 and 1968, also the Matadors couldn’t resist the infectious grooves from the omnipresent soul craze all over the world. Moreover since they were frequently playing abroad, particularly doing a Switzerland night club tour through the winter 1967/1968, where they were often asked to play popular dance tracks from the charts. In this context it’s not surprising that the album song Shotgun nicely fits into this blog’s scope. Unlike Junior Walker’s proto-funk original however, the Matadors’ version speeds up the tempo quite a bit and adds a trace of a Hendrix-like rock feeling due to heavy use of wah-wah guitar; lead guitaristRadim Hladík (1946) was the Czechoslovak pioneer in using the wah-wah pedal to such an extent, that he supposedly even invented the now commonly used Czech word for that device: kvákadlo. And also lead singer Viktor Sodoma (1945) must have been in a good shape on this recording date. His English phrasing is precise and he doesn’t shout as "over-the-top” as on some other Matadors tracks. The full Matadors story has been excellently documented in Aleš Opekar’s authorized biography book The Matadors – Beatová aristokracie z Prahy(Oftis 2007, ISBN 978-80-86845-91-3). While the book is written in Czech language only, it contains not only lots of photos and commonly understandable biographical data, but also a bonus CD with previously unreleased live recordings from 1966! (Hey, remember my interlude from last October…?) So if you are a serious collector of Czechoslovak oldies, this book belongs to your collection even if you don’t understand a word Czech. But as I’ve already noted last year, don’t expect any hi-fi quality – it is ahistorical document. Speaking of the Matadors story: last year in June I’ve coincidentally discovered that the English Wikipedia already has an article about The Matadors. Originally it was so full of errors then that I’ve decided to clean it up as well as to add some less known facts about the band. At that time I’ve already read Aleš’s nearly completed manuscript, so my informations were first hand. Hence I won’t repeat what I’ve already put together in a more or less serious form elsewhere (although the Wikipedia article isn’t complete yet). But for regular readers of Funky Czech-In it will be of interest when I point out the connections between other Czech groups and artists previously posted here, like Flamengo, Vladimír Mišík or Komety. 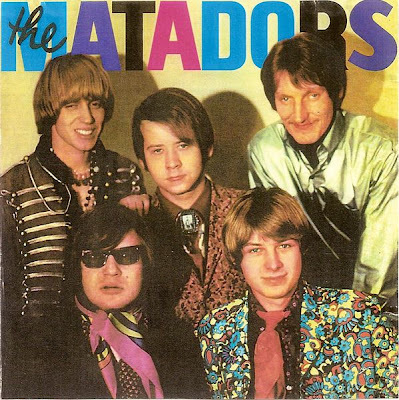 The Matadors album has been reissued in 1995 on CD, which also contains all tracks but one released on seven inches and Supraphon samplers between 1966 and 1968. It’s out of print but it still pops up for sale here and there on the web. There’s also a Korean CD reissue available, but as I’ve been told by Jan Obermayer recently, it’s quite likely a bootleg, as are most of the other releases on various low budget samplers in the past 10–15 years all over the world. Still, some Matadors tracks appeared every now and then on some of the protagonists’ official Best Of compilations, like Sodoma’s or Mišík’s.